Secure Connection Failed is a very common error that occurs when browsing internet on Firefox browser. It occurs only with websites that uses SSL (Secure Socket Layer) protocol i.e. websites with https instead of http. When “Secure Connection Failed” error occurs then you won’t be able to browse all the SSL protected websites or particular SSL websites. It is a very annoying error as it occurs particularly with Mozilla Firefox even though those sites are opening fine in other browsers like Internet Explorer, Google Chrome or Opera. There are many causes which can lead to “Secure Connection Failed” error in Firefox. So here in this post I will tell you the various causes and provide you the solutions or fix for Secure Connection Failed error for Firefox. Here are the various solutions for the secure connection failed error which occurs in Firefox when browsing https or SSL sites. You can follow these solutions one by one to see if the problem gets fixed or not. The first thing that you should do is reload or refresh the page when you encounter secure connection failed error in Firefox. To do this click on the reload current page icon located on the right side of the address bar or just press F5 in your browser window. You may also clear the cache and browsing history and then try reloading the page. If the site loads as normal then fine otherwise just move to the next step mentioned below. Advice: You may check the option “Report errors like this to help Mozilla identify and block malicious sites” to let know them about the issues and improve Firefox security. It may be possible that your ISP or Internet Service Provider is facing some kind of technical issues and this cause SSL sites to fail when loading. I generally face this issue during very slow internet speed with SSL sites as https sites needs somewhat more time to load than the normal http sites. So call your ISP to know that whether the issue is from their side or not. If there is no issue from the ISP and you are still facing Secure Connection Failed error then move to the next step mentioned below. It can be possible that you have an outdated version of firefox and it is causing secure connection failed error. So here I would like you to update your Firefox to the latest version. To update the firefox browser to the latest version go to Menu->Help->About Firefox. Here click Check for updates and if the update is there then click to update your Firefox browser. Also it is good practice to keep your firefox updated as to remain secure, bugs free and for better performance. Sometimes misconfigured ssl certificates or old and outdated security certificates on the website can throw Secure Connection Failed error in modern day browsers. This security certificate error can only be solved from the website end and you cannot do anything about it. The only thing you can do is to notify the site administrator of these security certificate errors. You can check the website for SSL certification errors by going to the following SSL Checker tool mentioned below. The error will go away when website make the necessary changes regarding SSL certificates. But if the website from their end is OK and you are still facing the issue then go to next step mentioned below. It may happen that some add-ons are causing this Secure Connection Failed error in your firefox browser. 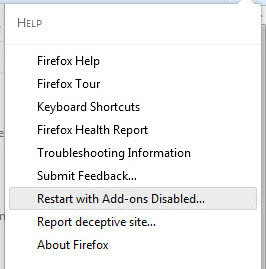 Here first restart the Firefox browser in Safe Mode with addons disabled by going to Menu->Help- and then click Restart with Add-ons Disabled. After disabling the addons if the SSL sites are opening then it means the issue is with one or more installed addons. To find out which add-on is causing the issue disable add-ons one by one by checking the site in between. If there is no issues with add-ons then move to the next fix mentioned below. Having wrong date / time in your system or computer can also throw certificate errors for some ssl websites and they will cease to open. To fix this just correct the date & time in your computer. If the date and time is correct or the error still persists the just follow the next solution mentioned below. Check that the proxy settings in your firefox browser. If have set any proxy then just remove it from there. To do this Go to Menu->Options->Advanced->Network->Settings. Here click on No proxy radio button and then click on Ok. If you have installed any proxy software then I would advise you to uninstall it completely. If you have no proxy set or the Secure Connection Failed error remains then move to the next step mentioned below. If your firefox is infected with malwares then it can happen that SSL websites will not load and firefox can throw secure connection failed error. Here use Malwarebytes Anti-malware to scan your computer and get rid of any infection. Other thing I prefer is to reset your Firefox browser to default settings. Read below on how you can reset the firefox browser. Reset the Firefox to its default original settings. To Reset Firefox go to Menu->Troubleshooting Information. Here Click on Refresh Firefox button located on the top right side of your computer screen. This will delete all your Firefox cache and restore original settings of Firefox. You may also try completely uninstalling and then installing Firefox if reset doesn’t work. There are very few websites which Firefox won’t load because of some security reasons or the websites fails to load on Firefox. In this case the only thing I would advise you to do is to use another browser for that particular websites. I have seen that Internet Explorer and Chrome works good with such websites. In the end I would like to say that I have listed down all the causes and solutions for Fix Secure Connection Failed error in Firefox. If you want to ask or suggest anything then you can do so by leaving a comment below. You are welcome my friend and keep visiting this blog for more useful articles. i am using Fujitsu LifeBook Laptop Lh532. It had windows 10 i installed chrome and fierefox but i faced SSL ERROR in many sites . google sites like youtube etc and fb working fine. but many sites SSL ERROR. i read on internet many solutions like time date, internet options setiings, chrome cache clear , firewall , delete host file etc, i have no anti virus.. finally i removed windows 10 and installed windows 7 from DVD. but still facing same problem…. but 1 thing i noticed..:- i use my samsung galaxy C5 dual sim for laptop internet connectivity. both sims are from different companies. when i use CSL Company sim there is no SSL error but when i use SMARTONE sim, it gives error,,, is this error due service provider,,,, please guide me. Yes it can occur due to service provider. so is there any solution ? because i have no other network available in this area. try to contact your service provider and tell them the issue.